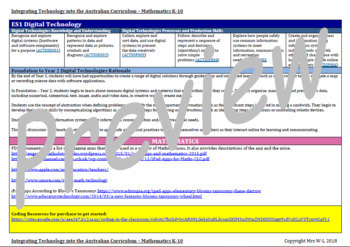 This editable word document, is based on the Australian Curriculum. 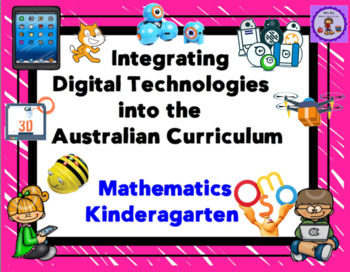 In this document you will find all outcomes and most indicators for the Early Stage 1 Maths K-10 Syllabus, matched against the new Digital Technologies Curriculum. I have colour coded how the digital technologies outcomes can be embedded with each of the Maths outcomes and indicators. 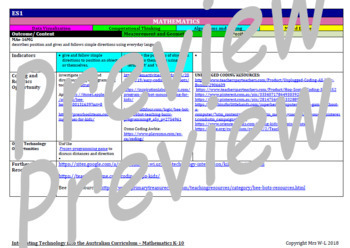 I have also listed technology lesson ideas and resources that can be used to teach each outcome and indicator from the Maths K-10 syllabus for kindergarten. Other lesson ideas are also included such as printables to support the teaching of the concepts in coding and robotics that can also be used. This document is growing. The more I research and learn, the more that will be added. 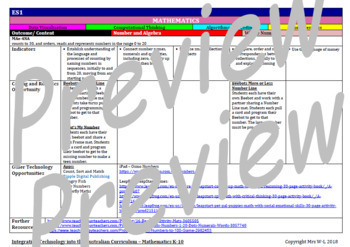 This document can also be edited by you to add your own lessons to the document. It can be used straight away! Use it tomorrow. Use it against your school's scope and sequence. Take the guess work out of how you can embed 21st Century, Future-Focused, Innovative technology ideas/ applications into your maths lessons. Pick up this document, look at what you are teaching in your program, match it against this document and then utilise the ideas. It's that simple. Be the first to know about store discounts, free products, and product launches! Just click the green “Follow Me” star under my store name on this page or click the “Follow Me” star under Mrs W-L. Copyright © 2018 Mrs W-L. All rights reserved. This purchase is for you and your classroom. Duplication for an entire school, an entire school system, or for commercial purposes is strictly forbidden. Please have other teachers purchase their own copy.